Each participant asked others to sponsor their famine. The final tally was $1,727.83 raised for World Vision. This money will feed 43 children, for a month, in the Democratic Republic of the Congo. 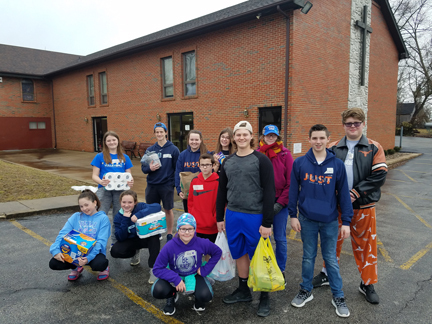 In addition, the participants brought items from home to donate to the New Melle Food Pantry and personally delivered them. The volunteers at the pantry organized an activity for the youth and spent time with them, explaining that hunger is a part of our New Melle community, as well as other countries. During their famine the youth learned about the Democratic Republic of the Congo, made dwellings out of cardboard to resemble the homes in that country, and did other activities to help understand the children of the Congo. Thank you to everyone who donated to make this possible. 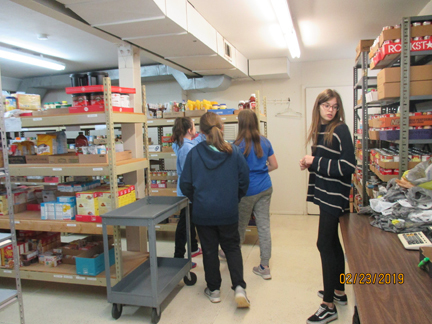 to the St. Vincent de Paul Food Pantry in New Melle. Helping out at the pantry.